In this long awaited full survey of the poetic writing of Korea's leading literary spokesperson, the translators have gathered poems from 42 years, representing numerous of the author's 135 books. As they note in their introduction, "Ko Un is...like a force of nature." Born in 1933 in southwestern Korea, he grew up in a Japanese-controlled land that was soon to experience the horrors of the Korean War. In 1952 he became a Buddhist monk, and began writing in the late 1950s. Since that time, Ko has been recognized as one of the most notable of living Korean writers and has regularly been nomi¬nated and short-listed for the Nobel Prize for Literature. 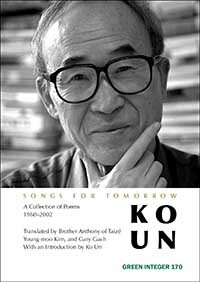 In 1982 Ko Un published his Collected Poems in Korea. Green Integer previously published a selection from his Maninbo as Ten Thousand Lives in 2005. As John Feffer wrote of that book in The Nation, "Maninbo, his masterpiece, is the people made flesh. Thanks to Ko Un, they continue to walk among us, all 10,000 of them." As the Kyoto Journal observed "It is a monumental work of twenty-five volumes containing short poetic portraits evoking, one by one, the many people Ko Un has encountered in his life, beginning with his childhood village and expanding out to figures in literature and history. Ko Un is widely acknowledged to be Korea's foremost contemporary poet; yet he is not "the literary poet" using his art to put a grid of order unto chaos (which is ultimately too simplistic and dualistic a perspective), but rather he is able to see from a bird's-eye view, all perspectives, without superimposing any judgment, pity or revulsion."